This picture’s goal was to create a sophisticated, romantic image of the bride and groom, sharing an intimate moment at their luxury wedding venue. 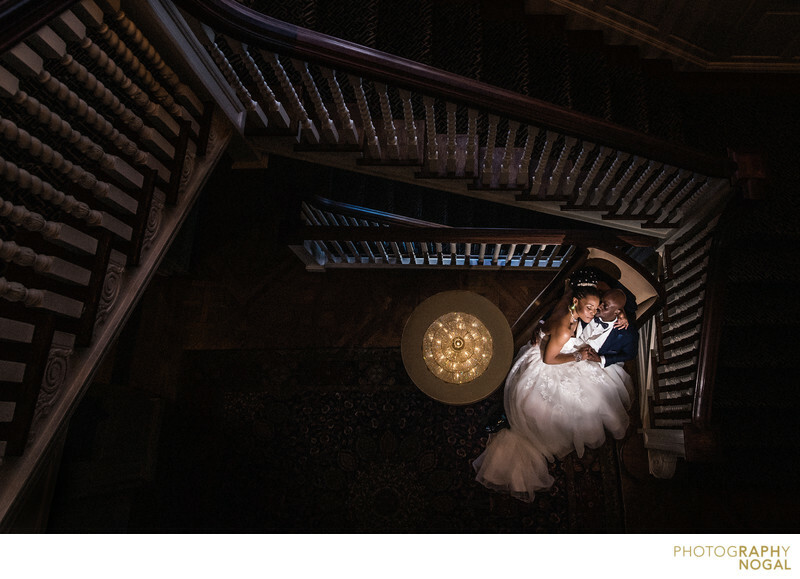 I used the gorgeous staircase at Toronto’s Graydon Hall Manor as a dramatic focal point, leading the eye through the photograph and right to the couple. The setting was combined with creative lighting to put a spotlight on the pair. This photo was taken with a Nikon D750 DSLR at ISO 1250, f4.5 aperture, 1/125th shutter speed with a Nikon Nikkor 20mm 1.8 zoom lens, at 20mm focal length. The lighting was a flash on a monopod, eld by Oliver. The flash contained the MagMod system, including a CTO gel, and a grid to narrow the beam of light on the couple.